As I mentioned in one of the summaries of IPCPR 2013, Felix Assouline was a company I was unfamiliar with before the show. I ran into my friend Benny Gomez, who has partnered with them to field his Havana Sunrise blend, and he pointed the booth out and introduced me to Michel Malek. The company is launching with four brands, the “EGO,” “Something Special,” “Havana Sunrise,” and “Ringo.” In the first of four reviews, we’re taking a look at the Ringo today. 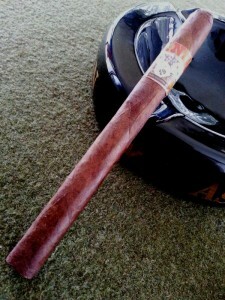 I’m smoking the “Colt,” a 6.5″X38 boxpressed lonsdale. The company literature describes the Ringo as “a call to our Western heritage. Ringo Cigars blend the past with the rich flavors that can only achieve with blending and processing tobaccos from many regions of the world. This results in a medium to full flavor cigar.” In speaking with Michel, I learned Felix Assouline strives toward vertical integration, growing some of their own tobacco (Jamastran, Honduras), producing cigars in their own factory (Esteli, Nicaragua), building boxes…and even an internal function for graphics design. I did not manage to get the blend info for this cigar yet, but will update this page once I acquire that bit of information [EDIT: I have received further information from Michel Malek: The wrapper is Habano 98, binder is Indonesian, and the filler blend is Nicaraguan/Honduran. MSRP is $6.00, which I believe is a great price for this cigar]. 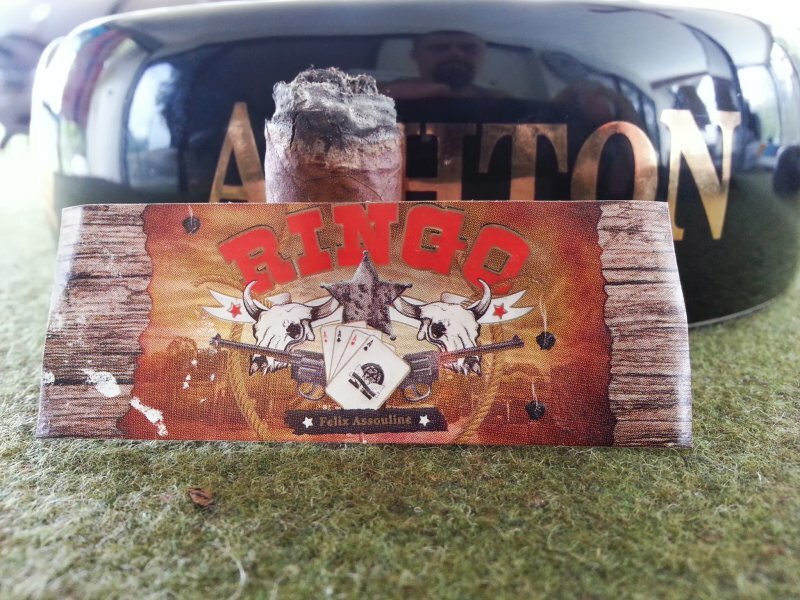 Just taking a quick look over the Ringo, it has a medium-dark brown, uniformly colored wrapper with moderate veins. The wrapper has a very silky complexion, and is quite oily and smooth to the touch. I find neither void nor soft spot in the roll; the bunch is very evenly distributed. The prelight aroma is mild on the wrapper, but more pronounced and earthy in character at the foot. The cold draw provides more earthiness and a bit of hay as well, and is in the sweet spot of resistance. The initial 10 minutes of smoking reveal a great deal of “zing” through the nose upon retrohale, and a subtle toasty nature in flavor. There is a healthy and pleasing dose of spice felt on the soft palate. Not that it means a lot to most, but I notice the ash is a brilliant white at this point. 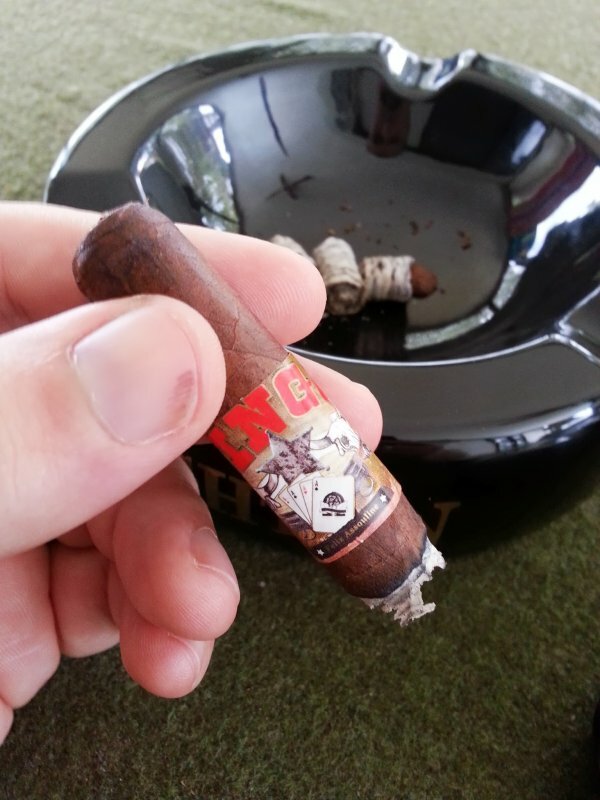 As I progress into the second third of the stick, the flavors really begin to soften into a sweet spiciness – much like some indeterminate baking spice. The aroma of the smoke from the Ringo is noteworth. It is very meaty and full in texture; somewhat reminiscent o f allspice in aroma. It provides a very classic cigar room note, with only the tiniest bit of “bite.” Moving into the final third of smoking, the flavors have continued to build, yet smoothed out in feel – almost a sweet citrus. The burn rate has been moderate and comfortable, with not so much as a single touchup being required for either of the samples I smoked. The sweet spice mentioned above has begun to fade at this point. A more toasty profile has developed, with some leather and a slight nuttiness coming to the forefront. Thank you Kip for this review but more importantly I’m really happy you enjoyed the cigar.